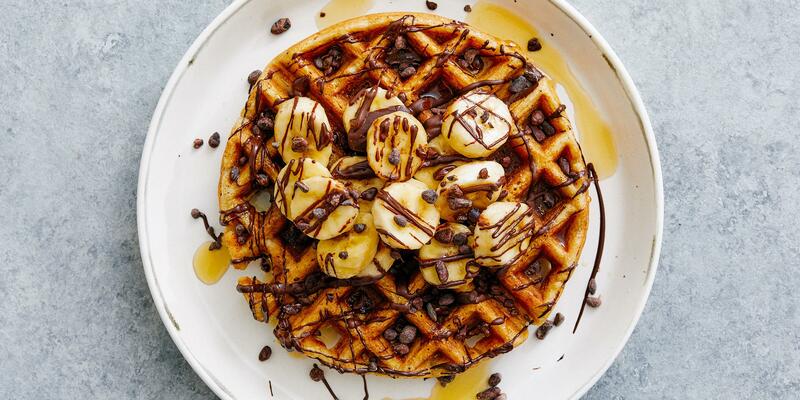 Raw honey adds sweetness to this yeasted dough, which rises twice. 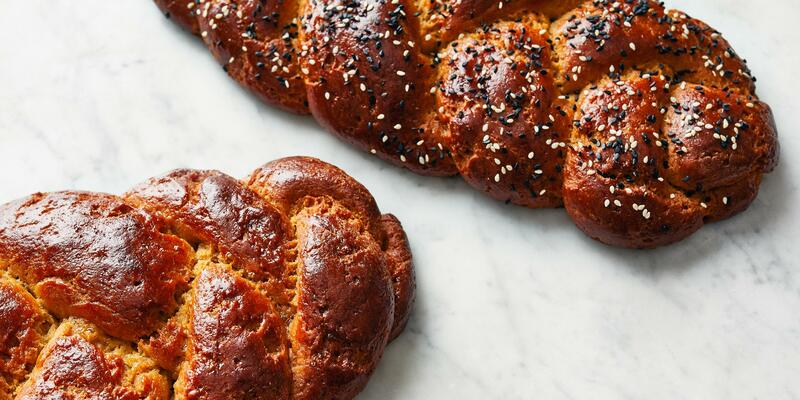 “If you’ve been missing the pleasure of challah because of a gluten sensitivity, this one’s for you,” says Brooklyn-based recipe developer Beth Lipton. She substitutes gluten-free flour for regular all-purpose, and advises pressing the dough back together if it cracks during the braiding or rising processes. “Gluten normally provides structure to bread, so the absence of it presents some challenges,” she explains. The flavor and texture are very satisfying and, if you’d like to add additional crunch and savoriness, sprinkle the loaf with sesame seeds or poppy seeds before baking. Grease a large bowl with olive oil. In a separate large bowl, stir sugar and ¼ cup water to combine. Sprinkle yeast on top and swirl to mix. Let stand until bubbling, 5 to 10 minutes. Add 6 tablespoons olive oil, remaining water, honey, eggs, yolk, and salt to yeast mixture and mix well. In a separate bowl, combine flour and baking powder. One cup at a time, add flour mixture to yeast mixture, stirring, until a dough forms. Then, knead dough until it becomes soft and smooth, about 1 to 2 minutes. Transfer dough to the greased bowl, turn to coat in oil, and cover loosely with lightly-greased plastic wrap. Cover bowl with a clean kitchen towel, and allow dough to rise in a warm place until nearly doubled in size, about 2 hours. Once nearly doubled, pat down into a rectangle, turn out onto a lightly-greased surface, and cut into 3 equal pieces. Using your hands, roll each piece into a 12-inch rope and place on baking sheet, braid them together, and place on a greased baking sheet. Cover with lightly-greased plastic wrap and kitchen towel, and set aside to rise again in a warm place until nearly doubled, 1½ to 2 hours. Preheat oven to 375 degrees F. In a small bowl, whisk egg white and 1 tablespoon water. Remove plastic wrap and towel, brush egg wash over top of challah, and sprinkle with seeds, if using. Bake for for 20 minutes, then loosely cover with foil and bake 10 to 15 minutes longer, until exterior is deep golden brown, and an instant-read thermometer inserted into center of loaf reads 190 degrees F. Let challah cool on a rack before serving. 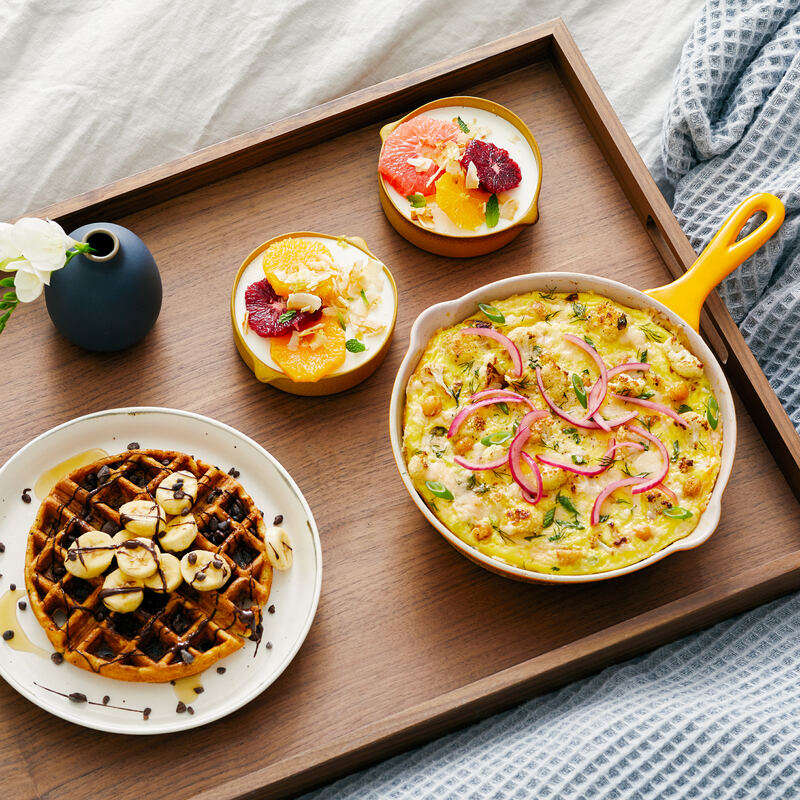 Breakfast in bed feels undeniably luxurious and romantic. Inspired by the Balinese dish gado-gado, these wraps pair protein and vegetables.